BACKTOFRANKBLACK.COM: BacktoFrankBlack revisits director Brett A. Hart and Bone Dry! BacktoFrankBlack revisits director Brett A. Hart and Bone Dry! If you remember last year, Mark Hayden made contact with an up and coming director named Brett A. Hart. 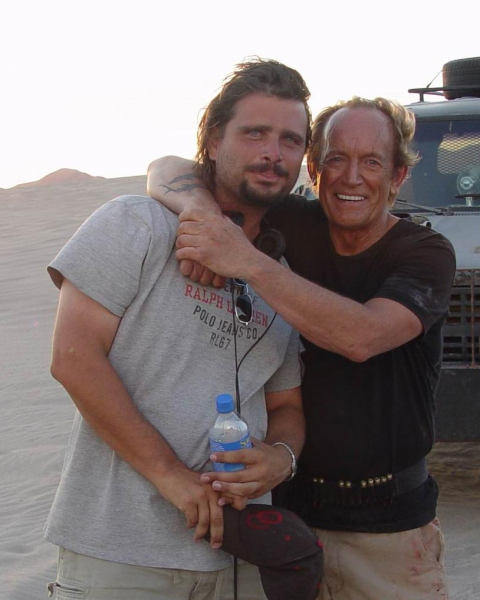 Brett was directing his first feature film and it starred Lance Henriksen and Luke Goss. There was a contest to win an autographed copy of the DVD and soundtrack. The contest was a huge success and Brett became a big supporter of Millennium and BacktoFrankBlack. Luke Goss and Lance Henrikson star in first time writer/producer/director Brett A. Hart's unforgiving tale of a vengeance pitting a mysterious man with a dark past against a sadistic tormentor intent on pushing his prey to the limits of human endurance. Eddie (Goss) is a family man who had just pulled off the highway for a quick cup of coffee when he was confronted by master manipulator Jimmy (Henrikson). Armed with a high-powered sniper rifle and a pair of walkie-talkies, Jimmy will now force Eddie to take the longest walk of his life. The setting is the Mojave Desert, and Eddie must walk north. Should Eddie turn in any other direction, Jimmy will put a bullet in his brain without hesitation. But this is no ordinary stroll in the sand, because along the way Eddie will be confronted with a series of ambushes and traps designed to wear away at both his dehydrated flesh and increasingly fragile psyche. Later, as the pair confront one another at their final destination - an open grave - it becomes painfully obvious that the men who once seemed polar opposites share more in common than appearances may suggest. If you haven't rented this m ovie, stop reading right now and go do so. Better yet, go to your local store and purchase the DVD, you will not be disappointed. 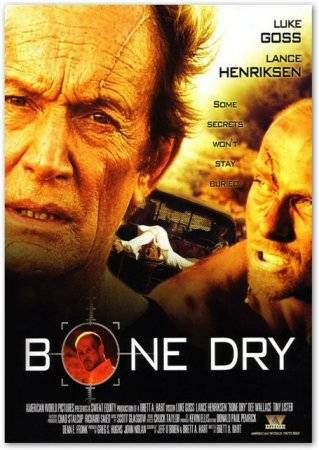 There are films that get released that do not get the media attention they deserve and Bone Dry is one of those films. Lance spoke very highly of Brett and the film itself when we interviewed him last year. He was very proud of the work that he did on that film. So with that in mind, we have a special treat for you. We spoke with Brett and asked if we could post an interview he did not too long ago discussing the movie Bone Dry. I am sure you will enjoy it as much as I did. As I said before, Brett has been nothing but great to BacktoFrankBlack and hopefully there are a few more projects on the horizon with him and the campaign. 3 Responses to "BacktoFrankBlack revisits director Brett A. Hart and Bone Dry!" This was an interesting, suspense-packed movie with the performances of the two leads pivotal to its success, and neither disappointed. Lance in partiuclar was superb, as ever - well worth being added to anyone's DVD shelf. I think Bone Dry is a good one, worth the purchase of the DVD. Wonderfully shot and good acting. While it's not perfect by all means, I think it could have benefited from a shorter running time, it would have made for a tighter and more intense film. I'm still very impressed with his debut film, I never thought it was his first film judging from that film. So, I'm looking forward what he comes up with next. I totally agree. Great thriller with two superb lead actors and a nice setting. But as Jósef said: it's not perfect. The final twist isn't all logical to me because Lukes character seems to have no clue why someone should torture him. But with his (former?) profession in mind that isn't very plausibel. Yet a very good movie. Every fan of Lance and movies like "Duell" should buy or rent it.